If you need a house in West Kensington to get cleared of just one item or its complete contents, fret not! 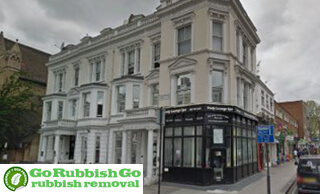 With our W14 rubbish removal experts, any size of property is in good hands. 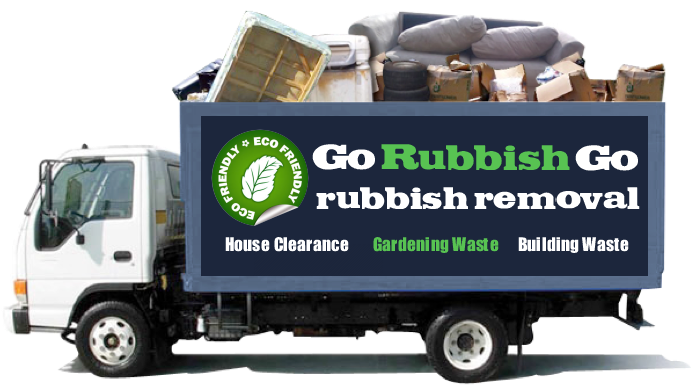 We, at Go Rubbish Go, employ specialists that will have it all cleared expertly. We clear all sorts of properties, starting with inhabitable houses, through to flats all the way to offices. 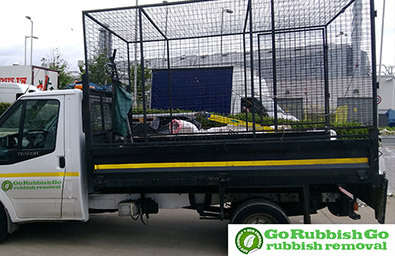 We will send the right West Kensington waste clearance team to cope with your task, starting from a team of two collectors, to teams of eight and more people. Just provide us with the room count and a full list of what is to be removed and we’ll do all the lifting and get rid of your rubbish in no time. We will clear all manner of furniture as well as appliances like cookers, freezers, fridges, microwaves and chairs, beds, couches, cabinets, wardrobes, side boards, televisions, carpets, flooring, and more. We have done rubbish disposal in West Kensington and for families all over the W8 region. If you have to clear out a home for sale or even for letting, or happen to be organizing W14 West Kensington waste removal because you just want to declutter your property, our rubbish clearance experts will clear you home swiftly and efficiently. Just call us on 020 8610 9182 today to book our team. 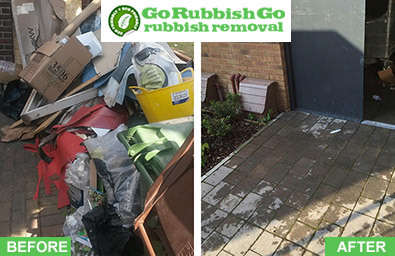 Every West Kensington waste collection service clients get from Go Rubbish Go is a positive experience. Our company provides many specialized and custom-made household junk removal services in W14. With the waste removal services we offer, we will have your home cleared fast, no matter how much bulky waste you need to clear. We handle W14 waste disposal tasks of any size and shape, from just one room of your home, up to a complete house clearance. We will clear just about all waste materials, including papers, clothing, books, bric-a-brac, junk and household mess. We can also perform a full attic, bedroom, living room and kitchen furniture disposal, even taking down wardrobes if needed. Our teams will bring all your waste to a tip or a recycling facility. Very professional and efficient staff! Got their rubbish disposal service last week. I had too much green waste that I needed to dispose of. My garden in West Kensington, W14 is so clutter-free now! Thank you guys! I couldn’t have asked for better help! Our team in W8 will get rid of any junk, anywhere around your property. 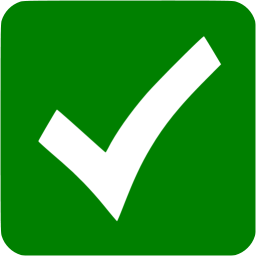 If you want to sell or let your home out and just need a few items eliminated or the property fully cleared of its contents, simply let us help and we will have it all eliminated and disposed of fast. We really are a company with a passion for what we do, so call us on 020 8610 9182 now and get your property cleared as fast as lightning. Let our experts take these problems out of your hands, as we help many households each year and will get your West Kensington rubbish clearance W14 task done very quickly indeed. We offer a variety of services at low prices. No job is too big for our hardworking team to handle. So, you can rest assured that if you live in West Kensington and require a rubbish clearance W14 service, we’ll be there in a hurry to sort out the situation. All you need to do is get on the phone and give us a call on 020 8610 9182 where you’ll be connected to one of our friendly representatives. They’ll ask you a few questions, recommend a few of our services to you, and then take you through the booking process. Call now and we guarantee that you will be impressed with the result! West Kensington is a section of West London mainly located within the Hammersmith and Fulham borough, also encompassing a few western areas from the Royal Borough of Kensington and Chelsea and located 3 and a half miles (about five km) west from Charing Cross. The London postal code W14 is approximately defined as the region between Brook & Hammersmith Road towards the west, Fulham towards the south, Shepherd’s Bush towards the north and to the east – Kensington. Local companies include little shops, restaurants as well as offices, with the Olympia Exhibition Centre nearby. It’s the mix of nearby shops that provides the area with its personality. West Kensington is easily accessible from Earl’s Court, as well as the Broadways of Hammersmith, Fulham and Notting Hill. There are many hotels and pubs here, like The Albion pub which is allegedly haunted. The Baron’s Court Theatre is also positioned in the basement of the “The Curtains Up” restaurant and bar.